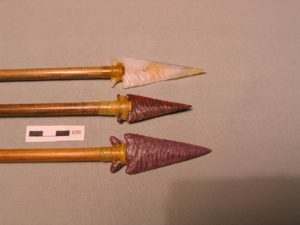 Personal unused hunting arrows: The points are Elko Eared type. Hafted with back strap tendon and rabbit skin hide glue. 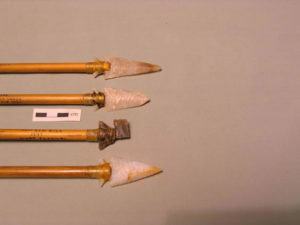 Personal Hunting Arrows: The points are Elko Eared type. Each of these points has taken a Deer or Elk. The top and bottom points have been retouched and are ready to use again. Tools of the Trade. 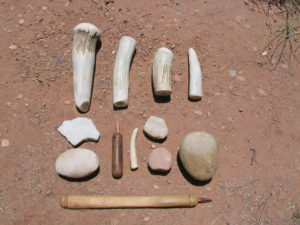 Moose antler billets, antler punch, abraider, hammerstones, copper pressure flaker, antler pressure flaker, and Ishi stick pressure flaker with copper tip.